464 Arboles Drive is located in the Mustang Mesa Area just outside of Bishop California. This is a great neighborhood if you’re looking for open spaces within walking or biking distance. This is a beautiful 3 Bedroom, 2 Bathroom, custom home that sits on 0.75 acre. The home was built in 2006 and has great vaulted ceilings and large bay windows. Travertine tiled floors throughout the home except for the bedrooms, which are carpeted. The beautiful kitchen has granite counters with rough edge finish, stainless appliances and cedar cabinets. Wood stove insert and forced central air to keep warm during the winter months and an evaporative cooler for the summer months. The Master Bathroom has a large Jacuzzi tub for relaxing evenings. Finished attached two car garage. This home has unobstructed views of the Sierra Nevada Mountain Range and Round Valley from the fully fenced backyard. Enjoy the sunrise over the White Mountains from the front patio area. Easy maintenance yards with automatic sprinklers front and back. The back yard had garden areas as well as a fire pit area if desired. 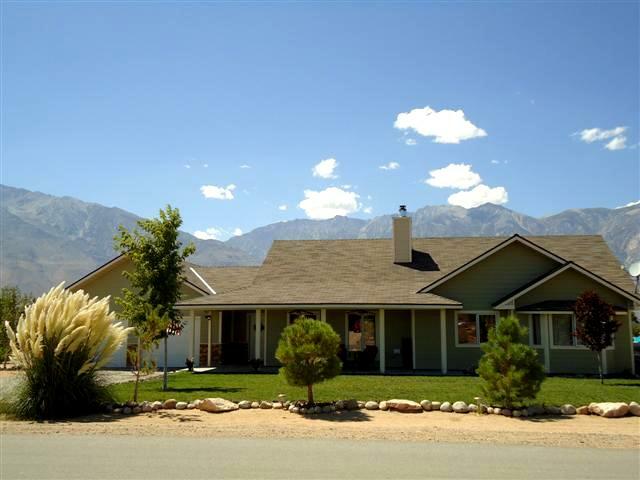 464 Arboles Drive is located in the Mustang Mesa neighborhood, north on Highway 395 between 9 and 17 miles from Bishop, with great views of the majestic Sierra Nevada. The properties in this area draw equestrian lovers and outdoor enthusiasts. The lots in this area range from .5 acre to slightly over 1 acre with the homes ranging in size of 1,200 to 3,000 square feet. Each property is serviced by individual wells and private septic systems.